After multiple opponents pulled out, former WWE superstar-turned-mixed martial arts fighter Bobby Lashley (6-1) finally has a fight for the Shark Fights 21 main event which takes place this Friday, Nov. 4 at Fair Park Coliseum in Lubbock, Texas. 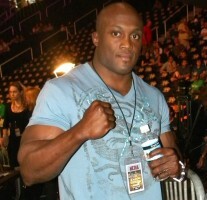 Lashley will square off against Shark Fights and King of the Cage veteran Mark Martinez (4-1) of New Mexico for the Shark Fights Heavyweight Title. The former pro wrestler is coming off a unanimous decision win over John Ott at Titan Fighting Championship 17 in March. Martinez, normally a light heavyweight, has won his last four bouts, including a second round knockout over Josh Luna at King of the Cage back in April. The Fair Park Coliseum doors open at 6 p.m. CT and the fights start at 7 p.m. CT. Unfortunately for fight fans unable to attend the live event, it will be over a month later when Shark Fights 21 airs via tape delay on FUEL TV on December 23. In the night’s co-main event, Australia’s Tony “The Gun” Bonello (15-1-1) will face TUF 7 hopeful (lost in elimination round) Dave Roberts (5-8) for the Shark Fights Light Heavyweight Title. Tickets for Shark Fights 21 are on sale at www.selectaseatlubbock.com. Tickets are priced at $20, $30, $40, $55, $65, $75, and $100. Visit www.sharkfights.com or www.facebook.com/sharkfights for more information.